Model #103.23440 around 1949. I added the table and motor but every thing else is original and works fine. Would like to sell this. Does anyone have a source for replacement blades for this saw that they can share with me. This machine is work is really very well. This machine model is so old but old is gold. This machine look and design is simple. Does anyone know of sources for parts? Looking for the hold down foot Part# 23712 that goes to the Craftsman 24" jigsaw model# 103.23440. Please help. I saw below post concerning a manual for Craftsman Scroll/jig saw 103.23440 posted on another site, but I am unable to locate the post on the other site. Can some some help me find a manual for this saw? I have one of these 149 Craftsman Jig Saws that I'd like to sell. I want to be able to use my jig saw but no one seems to be able to help me get new blades for it. Do you have any suggestions? I too have the same saw and would like the owner's manual. I have a copy of the manual that I would share. Do either of you have or be willing to take a picture of the hold down foot. Mine is missing and I would like to fabricate a new one. 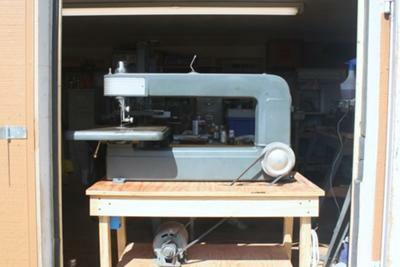 I currently own this same model jig saw, manufacturing date 1948, I need to find some replacement parts for it. everything is original to include the motor (not the belt). I am also looking for either a hard copy or an E-copy of the owners manual from the original sale. any information would be more than helpfull.